Small Budget - Big Design! | Fusion Design Consultants Small Budget - Big Design! Small Budget - Big Design! Select the perfect fit brokerage team to advise on market conditions and space availability. Determine the required location and building type. Determine the desired RSF – working with an Architectural Design Firm that specializes in corporate office work, the tenant should soon understand what the difference is between usable SF and rentable SF. Working with the Architect, the initial programming phase helps determine what the overall tenant space requirements should look like. Determine the required apportionment of built vs open space – The Architect should be advising on current and relevant workplace strategies with some idea of benchmarking in the relevant industry of the client. Determine if the existing base building systems are up to basic industry standards – It is always wise to engage a professional MEP/FP Engineer to assist with assessing the condition of the building’s Mechanical, Electrical, Plumbing and Fire Protection systems. This can be coordinated directly through your Architect partner. Establish the minimum building standards for construction from the Landlord’s perspective – This will normally come in the form of a ‘work letter’ and should clearly identify any special requirements from the building owner’s perspective. At present, the TI (Tenant Improvement) allowance from the Landlord will typically range from $50 - $65 per RSF for a 10,000-sf shell space with a 7-10 year lease term. The remaining tenant exposure for hard construction is anywhere above the TI allowance. We typically hear that our clients do not wish to come out of pocket for anything, but on an aggressive budget, it is typically $25 - $40 per RSF. It is also important that the tenant understand what the TI dollars can be used for. Exceptions will often include soft cost expenses like: professional design services, furniture, signage, security, supplemental HVAC or window treatments etc. Every building and every landlord works in different ways, but how the TI dollars can be used should all be part of the negotiation that takes place with your brokerage team, attorneys and the landlord. John Kelly relates that on average, 30-40% of hard construction costs are associated with mechanical, electrical, plumbing & fire protection (MEP/FP). As you can see, this is a significant part of the budget that generally does not contribute to any aesthetic value in the build-out. This knowledge is fundamental in understanding cost allocation. Clients are almost always shocked that the dollars they must spend are not going directly to fit and finish that which will accommodate the intended aesthetic of the space. So how can we design the compelling space that gets raves on our limited budget? 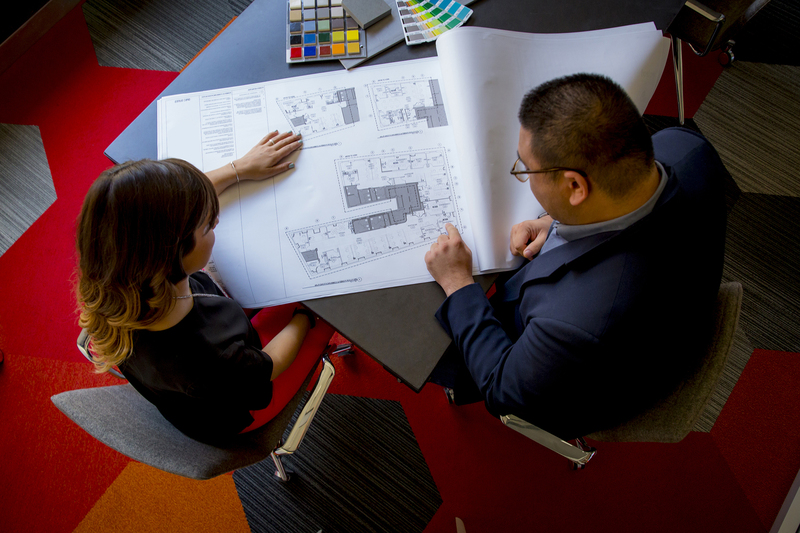 Work with your Architect to create a plan that helps push the boundaries of efficiency, flexibility and creativity. It is imperative that the space be designed to allow people to work in the most engaging way possible. Remember, the less you build, the more you have for fit, finish and graphics. However, the fully open plan concept is not relevant for all industries. The space must be designed for the specific end users, as well, at their job function. Reviewing floor plans to function at their highest potential. Investigate furniture solutions instead of millwork for bar counters, kitchen islands, bench seating and more. To save on the expensive millwork, minimize built in furniture and millwork and use a furniture product that can be depreciated more effectively than accounting for hard construction costs. Furniture can be placed to minimize the need for floor cores. Informal meeting spaces can be created with furniture solutions in lieu of more expensive hard construction. Incorporate more semi-private collaboration space in lieu of formal conference/meeting rooms to reduce the cost for walls, doors, frames, hardware as well as fire protection and HVAC. Determine how the client meets most effectively and plan for that. This is another key area to save your space dollars when necessary. Flooring materials can be varied to help designate spaces. Less expensive materials can be used in ‘back of house’ spaces to allow for more budget to be allocated to impactful areas such as reception or café etc. Alternate flooring materials (such as LVT – Luxury Vinyl Tile) are inexpensive and very appealing when hardwood, stone or polished concrete do not fit into the budget. Finally, minimize waste in the installation method of floor finishes: A herringbone carpet pattern, for example, creates more waste than a brick pattern installation. Aim for carpet in the $30 - $35 per SY range (installed). When thinking about watching the budget, environmental graphics is a truly cost-effective way to achieve eye-catching customization with a very high impact. These EG elements range from simple signage packages to curated custom electronic media, wall coverings and glass films to ceiling and floor applications that allow clients to push the boundaries on telling their brand story through images and words. This is also an area to let your creative flag fly high. 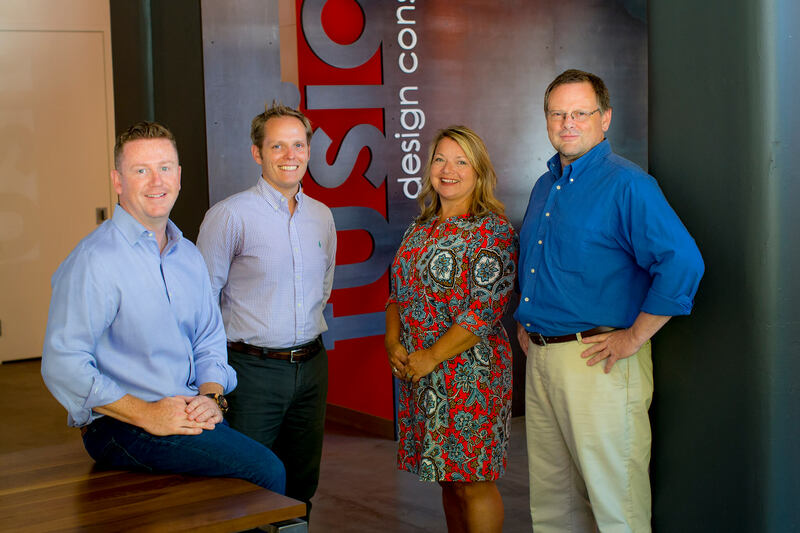 According to Michael Knauff, a principal at Fusion Design Consultants, Inc – “Choose brand over style. Incorporate custom wall graphics into the space in lieu of higher end wall and floor finishes”. Custom wall graphics clearly go the distance without hurting your bottom line. 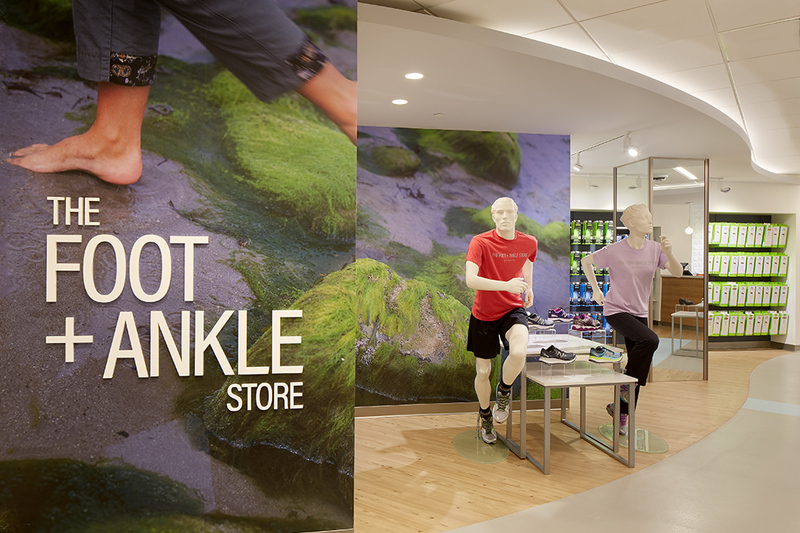 Jeff Sprague of Blinker Branding offers that large format digital prints are a great way to personalize the space. “At around $35 SF, they are inexpensive enough to produce in multiple locations or as one big wow moment. They can even be printed on material that is easily removable”. Blinker Branding views Environmental Graphics as an opportunity to make solid connections with clients and employees. “The content choices are endless”, relates Jeff, “and can range from a simple brand message (or image) to a full out visual corporate history”. Blinker handles the graphics as interior touchpoints that have the potential to go far beyond the corporate logo - and will not kill the budget! Custom wall graphics clearly go the distance without hurting your bottom line. Jennifer Peters believes that accent colors and variations in color tones can add interest and make a space feel highly customized at very little cost. You can make a significant design statement with well-chosen paint applications. We have outlined the 5 “Do’s” – 5 very achievable methods to keep your cost per SF down. Be cautious when designing open ceiling concepts – Contrary to what most people initially think, a large area of open concept ceiling is typically more expensive than a ceiling with an acoustic ceiling tile installation. 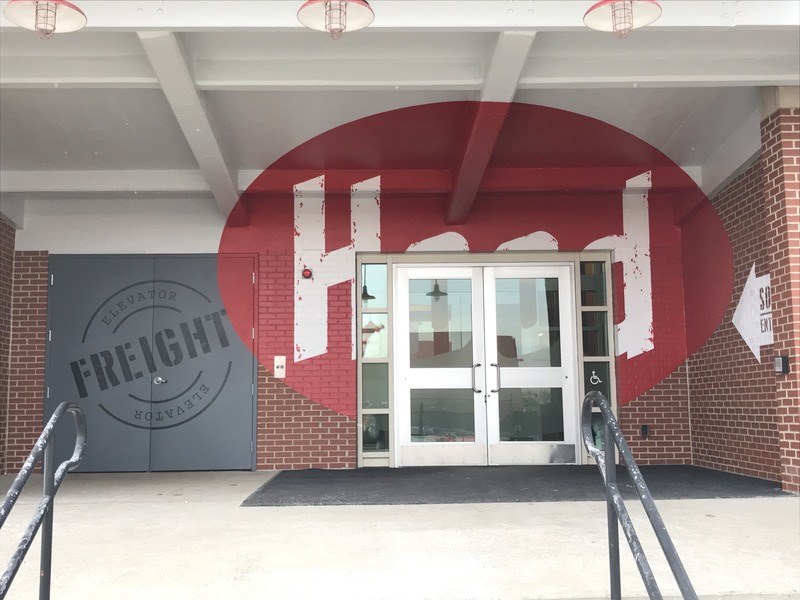 Minimize hard wall construction – This does apply to all industries, but the scale on which to cut back really must be tailored to the client and their type of work process. Be strategic about the quantity of interior glass - This is a more challenging task as glass is a major component to make an office feel open, transparent and relevant – but will offer a significant savings in your final SF cost. And finally, “take advantage of the ordinary”, offers Michael Knauff. “Every day low-cost materials, utilized in creative and unexpected ways, offer a tremendously big bang for the buck”. "Take advantage of the ordinary."